I am searching for Protection system also solar. I need software to calculate the solar system! This tool is of immense help Thank you for your effort. Could there be a mistake in the sizing of the inverter The calculation is given in kw thereby making the inverter very large. Can you please comment on this. Thank you. 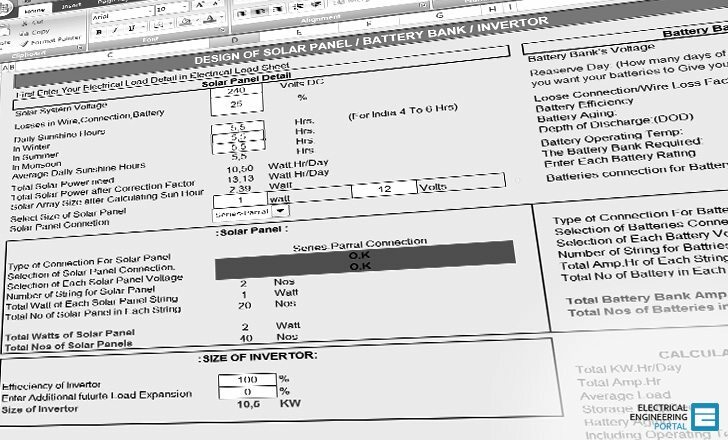 I have seen the excel sheet, you have prepared for design of solar panel, inverter and battery bank and it is awesome. Here, my application is little different on solar water heater. I want to maintain the 70 C temperature of 50 liters (approx) water using 500 W DC heater for 24×7. I want to size the solar panel, battery bank, solar charge controller. Excellent initiative and great work by Jignesh Parmar. Can I have your contact nos, as i have to discuss a project where I find the no of batteries and Panels required is very large. Hi Sir can you plz provide the calculation formulas for this excel. Hi Sir can you please provide the calculation formulas of this excel. In considering a stand alone system where the battery is supplying all of the energy as the sun goes down; then consider solar PV as the recharger. It need to be addressed in the order Load + losses => Battery; then charger & PV solar; then consider days without sunlight and multiply accordingly. The issues are further complicated by considering the battery banks maximum charge current. Do that with lead acid and it gets truly massive! Hi! 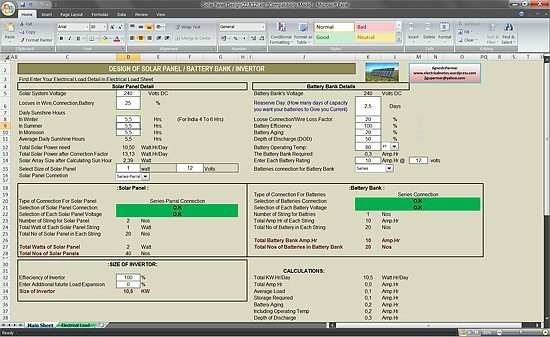 I cant downlod the sheet link for calculator sixe of Solar pannel, Battery bank and Inverter. Nice work still few things I would like to explain . Consider the power factor of Not only UPS but also for batteries .example. 700 watts/.85 = x ▶ invt eff. HENCE , 3 BATTERIES ARE NEEDED FOR A 700 WATT LOAD ON A 3 BATTERY SYSTEM (36 VDC) for 3 hrs backup. To calculate the size and power backup solution Batterybhai.com provides Power Calculator. solar technology is the the best power savings at our time. It is a very good site, to enhance our expertise and ability and be more professional. Nice spreadsheet. This will definitely come in handy when calculating the size of your battery bank. I observed that a corresponding increase in the battery backup time (autonomy) doesn’t affect the sizing of the solar arrays. In essence, a 24kW solar power (200W by 48V panels) is not affected despite increasing the number of days of backup power. The number of batteries increase but not the panels. I was expecting the solar panel side to flag an error but it remained green (ok) despite varying days of backup. Increase in batteries should automatically result into more panels to ensure batteries are adequately charged. Can you comment on my observation please? Very true, there’s no way you can add the batteries to cater for the days of autonomy and you fail to add solar panels. If only you add batteries, the system will not be getting enough charges therefore it is a must for solar panels to be added to the system. I am new in this field, and i want to learn how this calculator works for calculating the load. when i am using it, it ask for the password. i am having some knowlege of it but wish to know the way that how to calculate the size of solar panel, battery and inverter. this tool design on AC load but i need a tool that design for DC load. or any one can tell me that relation between DC and AC load. I have a project of Installing Solar Power System on a Terris of a building having an area of 3000 sq ft. It is a 10 storey building having three flats/apartments on each floor with each flat/apartment has a load of 18420 watt hours or 18.42 kWh. It’s my project so I am facing problem to calculate what types of panels I should use to produce that much voltage by panels with installing batteries.. Please help with this with the appropriate solar panel strategy or planning. You can also email me for further details if you want for this purpose. I am yet to try your calculator. I tried to use this calculator for sizing solar panels in hybrid system for micro GSM BTS, but size of invertor is too big for total load of 500 W. For total load of 500 W with operational time 24 h per day, calculator gives size of invertor about 555 KW. I do not understand why. I guess there is mistake in cell which shows KW. I think there is some mistake…. This is the great site for EE in the web i have ever seen! Thanks to all the developers for sharing their great works. the link doesnt work so cant download, ???? You will see ‘Download’ button on top-right. it’s free tool but password protected !!!! … delicious food but in the showcase !!! Fabulous work.. This surely is a time saver..
You’re welcome! All credits goes to mr. Jignesh Parmar!